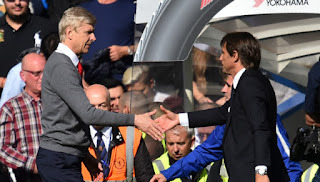 Chelsea Manager Antonio Conte has pay to tribute to departing Arsenal Boss Arsene Wenger hailing his impact on the London club. We racall Arsene Wenger announced yesterday that he will stand down as Arsenal Manager by the end of the season bringing an end to his 22-year reign with the club. In an Interview, Conte was full of praises for the Manager and his long stay in the club hailing but him and former Manchester United boss Sir Alex Ferguson. "I think we must pay great tribute to Arsene Wenger for his career in Arsenal. In him and Sir Alex Ferguson, we are talking about the last two managers to stay for such long time in a club." "Arsene Wenger was working 22 working 22 years for Arsenal, I think that's great. It's fanstatics. It's fantastic history. He won a lot with this club for this reason I think he deserves a great tribute for his career." "To play good football, to play creative football, to play offensive football. And I think he deserves a great tribute also for this." "He deserves great respect. I repeat we are talking about one of the greatest managers in the world with an important career in Arsenal." "He desservs a great tribute fo his career and it will be very difficult to see in the future another manager to stay such long time at the same club." "I think Sir Alex Ferguson and Arsene Wenger they were a really good story for football. Now it will be very difficult to see again another situation like this." Who do you think shoud replace Wenger at Arsenal?